Closer Dennis Sarfate completed an impressive postseason award haul on Monday, when he was named the Pacific League's Most Valuable Player. 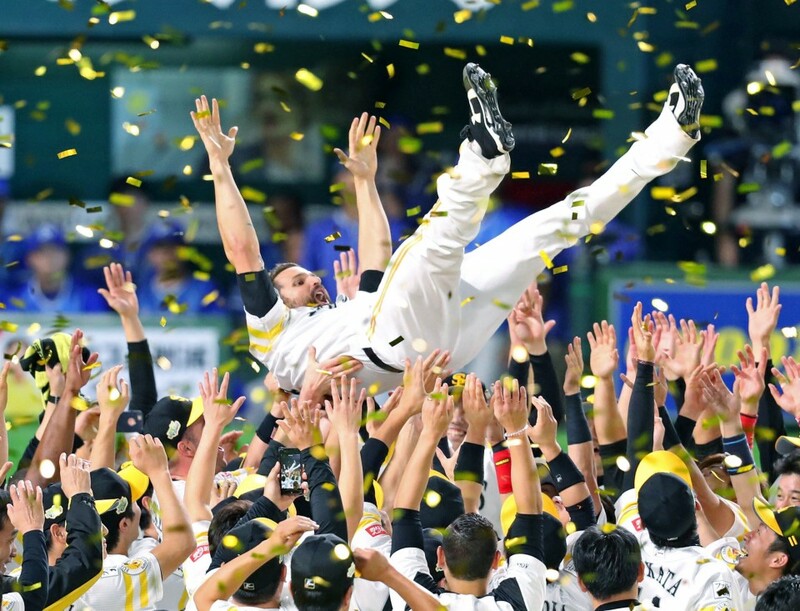 The 36-year-old Sarfate, who saved a record 54 games for the SoftBank Hawks, was also the Japan Series MVP and the unexpected winner of the Shoriki Award. 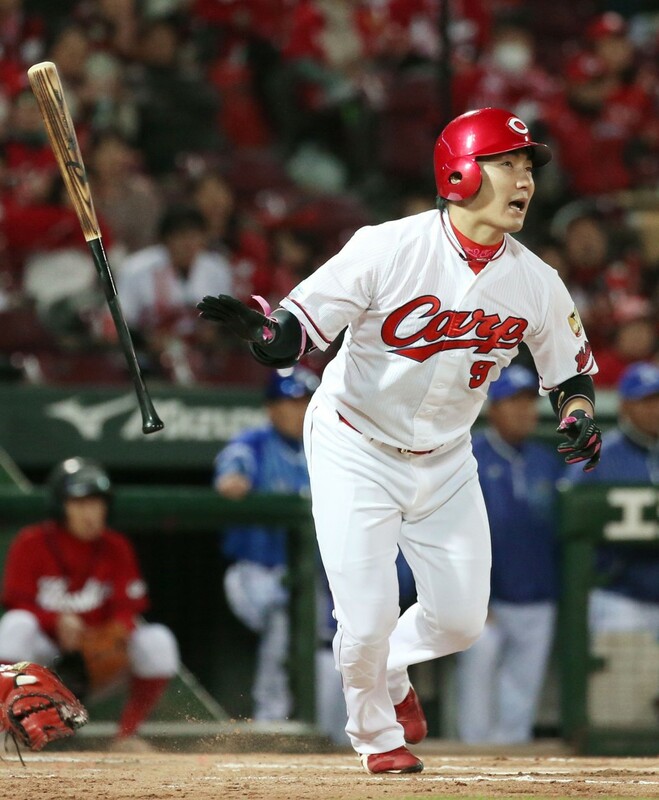 Center fielder Yoshihiro Maru of the Central League champion Hiroshima Carp was voted CL MVP. Both were first-time winners. Each league's Rookie of the Year Award went to a shortstop, the PL's to Sosuke Genda of the Seibu Lions and the CL's to the Chunichi Dragons' Yota Kyoda. Each MVP voter casts three votes for first (5 points), second (3) and third (1). Sarfate received 180 first-place votes in the ballot, and 983 points overall to finish ahead of Hawks center fielder Yuki Yanagita (421). Maru won by a larger margin, 1,134 to 381 over Carp pitcher Kazuki Yabuta. "I would never imagine a reliever, a closer, would win the award," said Sarfate, who made a 36-hour roundtrip from his home in Arizona to attend the ceremony. 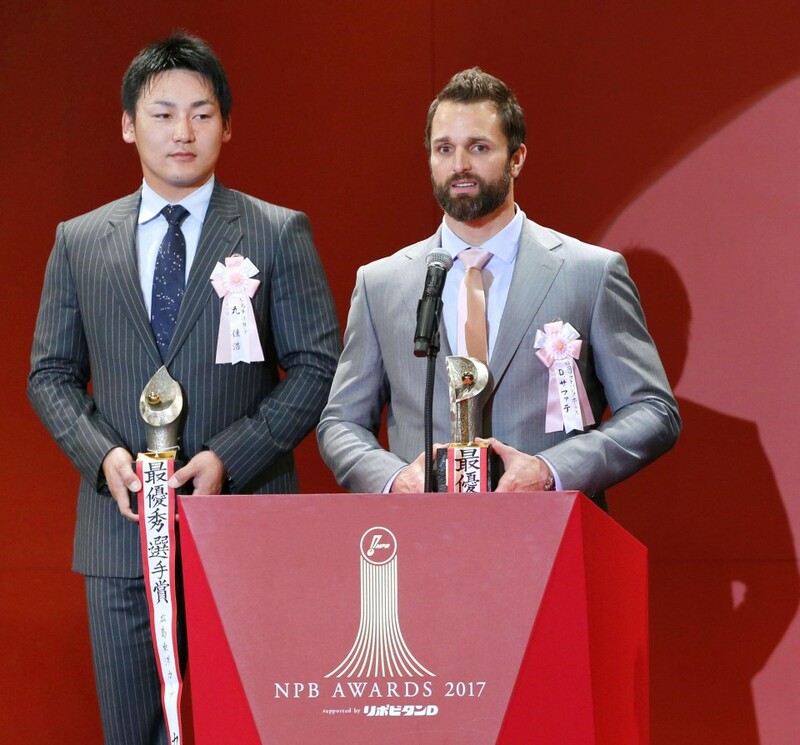 "I'm honored by those who voted for me, to recognize me with Yanagita and (Lions center fielder Shogo) Akiyama, some of the best players in the league. It's humbling, but it's also something I'll cherish for the rest of my life." Sarfate is only the second foreign-born pitcher to be an MVP in either league and the first since Hawks right-hander Joe Stanka in 1964. Prior to 1950's expansion into two leagues, Russian Victor Starffin won in 1939, and Hanshin Tigers right-hander Tadashi "Bozo" Wakabayashi, a dual national from Hawaii who settled on Japanese citizenship, won in 1944 and 1947. This was the fifth season in which Sarfate was a full-time closer in Japan, and in every season he posted a career best saves total, starting with 35 in 2011, and improving his total every year since joining SoftBank in 2014. Maru led the CL with 109 runs, was third with 92 RBIs, while batting .308 this season, two points shy of his career high. The 28-year-old reached career-best figures in runs, RBIs, doubles (35), home runs (23) and slugging average (.505). "This season, our team theme was building rallies," Maru said. "From the standpoint of results, I surpassed what I had done the year before. It was a very productive year." "I'm the kind of player with big ups and downs in my form, but relatively speaking this year, it was a season in which the fluctuations were quite small." This marked the first time in 21 years that both rookie of the year awards went to position players. Nippon Ham's Makoto Kaneko and the Yomiuri Giants' Toshihisa Nishi won the award in 1996. The MVP and Rookie of the Year awards are voted by Japan's baseball media prior to the Japan Series on the same ballot as the Best Nine awards announced on Friday, when Maru earned his third award. The same ballot that elected Sarfate as the PL's league's most valuable player chose Seibu Lions pitcher Yusei Kikuchi as the PL's best pitcher by a huge margin (196-34). This begs the question of how many voters thought Kikuchi's performance was actually superior but voted Sarfate the MVP because he pitched for the league champions. Genda, 24, the Lions' third draft pick a year ago, played every inning at shortstop this season. He batted .270, led both leagues in triples with 10, finished second in the PL with 37 stolen bases and third in runs scored with 85. In the field, Genda's 21 errors at short were the most in either league, but he also led the PL in put outs, assists and double plays and finished second in the Golden Glove voting. "All season, I was seeing something new almost every day," Genda said. "I felt the best thing was just to attack each day as it came." "Most of the errors I made this season were on routine plays, and I've been talking to the coaches and my focus is on treating each easy grounder extremely carefully. I need to set new standards and push myself so that a year from now I can look back at next season with satisfaction." Kyoda, 23, was the Dragons' second pick last year. His 96 double plays were the most by a shortstop in NPB. He batted .264 and led the CL with eight triples. "My goal is to do what Genda did," Kyoda said. "Next year I want to play every inning in every one of our 143 games. But I consider it an achievement to have spent the entire season with the first team." Both players won handily in the voting, with Genda getting 252 of 258 valid votes cast, and Kyoda receiving 208 out of 286.